This article, the last in the series, examines the different composite production methods. 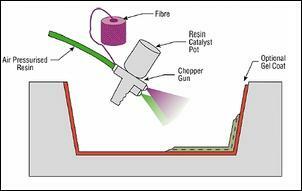 Fibre is chopped in a hand-held gun and fed into a spray of catalysed resin directed at the mould. The deposited materials are left to cure under standard atmospheric conditions. Widely used for many years. Low cost way of quickly depositing fibre and resin. Laminates tend to be very resin-rich and therefore excessively heavy. Only short fibres are incorporated which severely limits the mechanical properties of the laminate. Resins need to be low in viscosity to be sprayable. This generally compromises their mechanical/thermal properties. The high styrene contents of spray lay-up resins generally means that they have the potential to be more harmful and their lower viscosity means that they have an increased tendency to penetrate clothing etc. Limiting airborne styrene concentrations to legislated levels is becoming increasingly difficult. Simple enclosures, lightly loaded structural panels, e.g. caravan bodies, truck fairings, bathtubs, shower trays, some small dinghies. Resins are impregnated by hand into fibres which are in the form of woven, knitted, stitched or bonded fabrics. This is usually accomplished by rollers or brushes, with an increasing use of nip-roller type impregnators for forcing resin into the fabrics by means of rotating rollers and a bath of resin. Laminates are left to cure under standard atmospheric conditions. Low cost tooling, if room-temperature cure resins are used. Wide choice of suppliers and material types. Higher fibre contents, and longer fibres than with spray lay-up. Resin mixing, laminate resin contents, and laminate quality are very dependent on the skills of laminators. Low resin content laminates cannot usually be achieved without the incorporation of excessive quantities of voids. Health and safety considerations of resins. The lower molecular weights of hand lay-up resins generally means that they have the potential to be more harmful than higher molecular weight products. The lower viscosity of the resins also means that they have an increased tendency to penetrate clothing etc. Limiting airborne styrene concentrations to legislated levels from polyesters and vinylesters is becoming increasingly hard without expensive extraction systems. Resins need to be low in viscosity to be workable by hand. This generally compromises their mechanical/thermal properties due to the need for high diluent/styrene levels. This is basically an extension of the wet lay-up process described above where pressure is applied to the laminate once laid-up in order to improve its consolidation. This is achieved by sealing a plastic film over the wet laid-up laminate and onto the tool. The air under the bag is extracted by a vacuum pump and thus up to one atmosphere of pressure can be applied to the laminate to consolidate it. Resins: Primarily epoxy and phenolic. Polyesters and vinylesters may have problems due to excessive extraction of styrene from the resin by the vacuum pump. Fibres: The consolidation pressures mean that a variety of heavy fabrics can be wet-out. Higher fibre content laminates can usually be achieved than with standard wet lay-up techniques. Lower void contents are achieved than with wet lay-up. Better fibre wet-out due to pressure and resin flow throughout structural fibres, with excess into bagging materials. Health and safety: The vacuum bag reduces the amount of volatiles emitted during cure. Large, one-off cruising boats, racecar components, core-bonding in production boats. This can be a very fast and therefore economic method of laying material down. Resin content can be controlled by metering the resin onto each fibre tow through nips or dies. Fibre cost is minimised since there is no secondary process to convert fibre into fabric prior to use. Structural properties of laminates can be very good since straight fibres can be laid in a complex pattern to match the applied loads. The process is limited to convex shaped components. Fibre cannot easily be laid exactly along the length of a component. Mandrel costs for large components can be high. The external surface of the component is unmoulded, and therefore cosmetically unattractive. Low viscosity resins usually need to be used with their attendant lower mechanical and health and safety properties. Chemical storage tanks and pipelines, gas cylinders, fire-fighters breathing tanks. Fibres are pulled from a creel through a resin bath and then on through a heated die. The die completes the impregnation of the fibre, controls the resin content and cures the material into its final shape as it passes through the die. This cured profile is then automatically cut to length. Fabrics may also be introduced into the die to provide fibre direction other than at 0 degrees. Although pultrusion is a continuous process, producing a profile of constant cross-section, a variant known as ‘pulforming’ allows for some variation to be introduced into the cross-section. 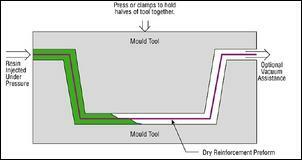 The process pulls the materials through the die for impregnation, and then clamps them in a mould for curing. This makes the process non-continuous, but accommodating of small changes in cross-section. Resins: Generally epoxy, polyester, vinylester and phenolic. This can be a very fast, and therefore economic, way of impregnating and curing materials. Resin content can be accurately controlled. Fibre cost is minimised since the majority is taken from a creel. Structural properties of laminates can be very good since the profiles have very straight fibres and high fibre volume fractions can be obtained. Resin impregnation area can be enclosed thus limiting volatile emissions. Heated die costs can be high. Beams and girders used in roof structures, bridges, ladders, frameworks. Fabrics are laid up as a dry stack of materials. These fabrics are sometimes pre-pressed to the mould shape, and held together by a binder. These ‘preforms’ are then more easily laid into the mould tool. A second mould tool is then clamped over the first, and resin is injected into the cavity. 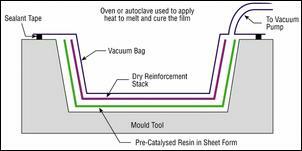 Vacuum can also be applied to the mould cavity to assist resin in being drawn into the fabrics. This is known as Vacuum Assisted Resin Injection (VARI). Once all the fabric is wet out, the resin inlets are closed, and the laminate is allowed to cure. Both injection and cure can take place at either ambient or elevated temperature. Resins: Generally epoxy, polyester, vinylester and phenolic, although high temperature resins such as bismaleimides can be used at elevated process temperatures. Fibres: Any. Stitched materials work well in this process since the gaps allow rapid resin transport. Some specially developed fabrics can assist with resin flow. Cores: Not honeycombs, since cells would fill with resin, and pressures involved can crush some foams. High fibre volume laminates can be obtained with very low void contents. Good health and safety, and environmental control due to enclosure of resin. Both sides of the component have a moulded surface. Matched tooling is expensive, and heavy in order to withstand pressures. Generally limited to smaller components. Unimpregnated areas can occur resulting in very expensive scrap parts. Small complex aircraft and automotive components, train seats. Other Infusion Processes - SCRIMP, RIFT, VARTM etc. Fabrics are laid up as a dry stack of materials as in RTM. The fibre stack is then covered with peel ply and a knitted type of non-structural fabric. The whole dry stack is then vacuum bagged, and once bag leaks have been eliminated, resin is allowed to flow into the laminate. The resin distribution over the whole laminate is aided by resin flowing easily through the non-structural fabric, and wetting the fabric out from above. Resins: Generally epoxy, polyester and vinylester. Fibres: Any conventional fabrics. Stitched materials work well in this process since the gaps allow rapid resin transport. As RTM above, except only one side of the component has a moulded finish. Much lower tooling cost due to one half of the tool being a vacuum bag, and less strength being required in the main tool. Large components can be fabricated. Standard wet lay-up tools may be able to be modified for this process. Cored structures can be produced in one operation. Relatively complex process to perform well. Resins must be very low in viscosity, thus comprising mechanical properties. Some elements of this process are covered by patents (SCRIMP). Typical Applications: Semi-production small yachts, train and truck body panels. Fabrics and fibres are pre-impregnated by the materials manufacturer, under heat and pressure or with solvent, with a pre-catalysed resin. The catalyst is largely latent at ambient temperatures giving the materials several weeks, or sometimes months, of useful life when defrosted. However to prolong storage life the materials are stored frozen. The resin is usually a near-solid at ambient temperatures, and so the pre-impregnated materials (prepregs) have a light sticky feel to them, such as that of adhesive tape. Unidirectional materials take fibre direct from a creel, and are held together by the resin alone. The prepregs are laid up by hand or machine onto a mould surface, vacuum bagged and then heated to typically 120-180 degrees C. This allows the resin to initially reflow and eventually to cure. Additional pressure for the moulding is usually provided by an autoclave (effectively a pressurised oven) which can apply up to 5 atmospheres to the laminate. Resins: Generally epoxy, polyester, phenolic and high temperature resins such as polyimides, cyanate esters and bismaleimides. Fibres: Any. Used either direct from a creel or as any type of fabric. Cores: Any, although special types of foam need to be used due to the elevated temperatures involved in the process. Resin/catalyst levels and the resin content in the fibre are accurately set by the materials manufacturer. High fibre contents can be safely achieved. The materials have excellent health and safety characteristics and are clean to work with. 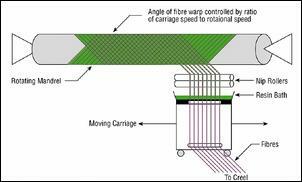 Fibre cost is minimised in unidirectional tapes since there is no secondary process to convert fibre into fabric prior to use. Resin chemistry can be optimised for mechanical and thermal performance, with the high viscosity resins being impregnable due to the manufacturing process. The extended working times (of up to several months at room temperatures) means that structurally optimised, complex lay-ups can be readily achieved. Potential for automation and labour saving. Materials cost is higher for pre-impregnated fabrics. 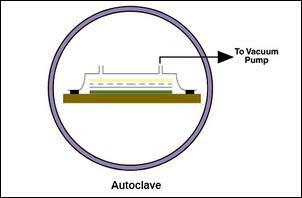 Autoclaves are usually required to cure the component. These are expensive, slow to operate and limited in size. Core materials need to be able to withstand the process temperatures and pressures. Aircraft structural components (e.g. wings and tail sections), F1 racing cars, sporting goods such as tennis racquets and skis. Low Temperature Curing prepregs are made exactly as conventional prepregs but have resin chemistries that allow cure to be achieved at temperatures from 60-100 degrees C. At 60 degrees C, the working life of the material may be limited to as little as a week, but above this working times can be as long as several months. The flow profiles of the resin systems allow for the use of vacuum bag pressures alone, avoiding the need for autoclaves. Fibres: Any. As for conventional prepregs. Cores: Any, although standard PVC foam needs special care. All of the advantages 1-6 associated with the use of conventional prepregs are incorporated in low-temperature curing prepregs. Cheaper tooling materials, such as wood, can be used due to the lower cure temperatures involved. Large structures can be readily made since only vacuum bag pressure is required, and heating to these lower temperatures can be achieved with simple hot-air circulated ovens, often built in-situ over the component. Conventional PVC foam core materials can be used, providing certain procedures are followed. Materials cost is still higher than for non-preimpregnated fabrics. 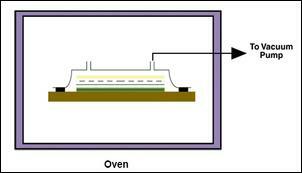 An oven and vacuum bagging system is required to cure the component. Tooling needs to be able to withstand above-ambient temperatures involved (typically 60-100 degrees C). Still an energy cost associated with above-ambient cure temperature. High-performance wind-turbine blades, large racing and cruising yachts, rescue craft, train components. Dry fabrics are laid up interleaved with layers of semi-solid resin film supplied on a release paper. The lay-up is vacuum bagged to remove air through the dry fabrics, and then heated to allow the resin to first melt and flow into the air-free fabrics, and then after a certain time, to cure. Cores: Most, although PVC foam needs special procedures due to the elevated temperatures involved in the process. High fibre volumes can be accurately achieved with low void contents. Good health and safety and a clean lay-up, like prepreg. High resin mechanical properties due to solid state of initial polymer material and elevated temperature cure. Potentially lower cost than prepreg, with most of the advantages. Less likelihood of dry areas than SCRIMP process due to resin travelling through fabric thickness only. Not widely proven outside the aerospace industry. An oven and vacuum bagging system is required to cure the component as for prepreg, although the autoclave systems used by the aerospace industry are not always required. Tooling needs to be able to withstand the process temperatures of the resin film (which if using similar resin to those in low-temperature curing prepregs, is typically 60-100 degrees C). Aircraft radomes and submarine sonar domes.